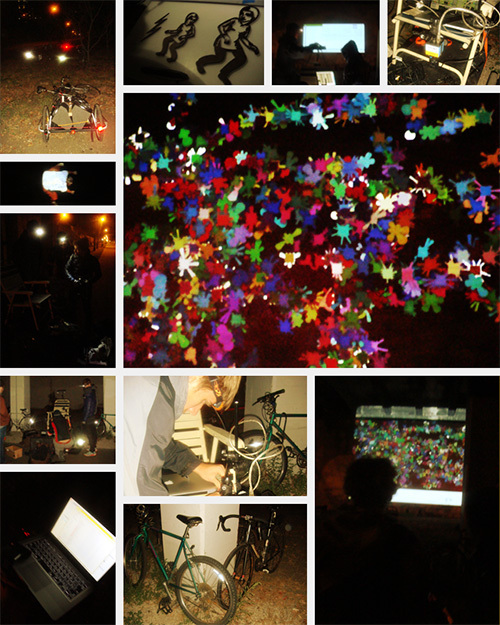 Mobile Experiential Cinema: The Parade premiered during the 2012 Northern Spark Festival. Mobile Experiential Cinema is a roving, storytelling platform that combines mobility, filmmaking, public projection, live theater action, and sound. The most recent version, The Parade, which follows a kidnapping narrative, invites a group of cyclists to meet and progress on a bike ride through the city following a predetermined path that supports the plot of the story. Audience members are instructed to periodically stop and view short episodic film segments that are projected onto urban structures. Between each of the segments, the audience is confronted with live theatrical actions that blur the borders between the filmic story and reality. The Parade presents key story elements via the projections, while other supporting live action elements include the live kidnapping of an audience member, a money and hostage exchange, planted artifacts, and live phone calls from key characters in the story. By combining all of these elements, MEC’s aim is to create an expanded cinematic world that roving audiences can be fully immersed within. Mobile Experiential Cinema: The Parade from Ben Moren on Vimeo. 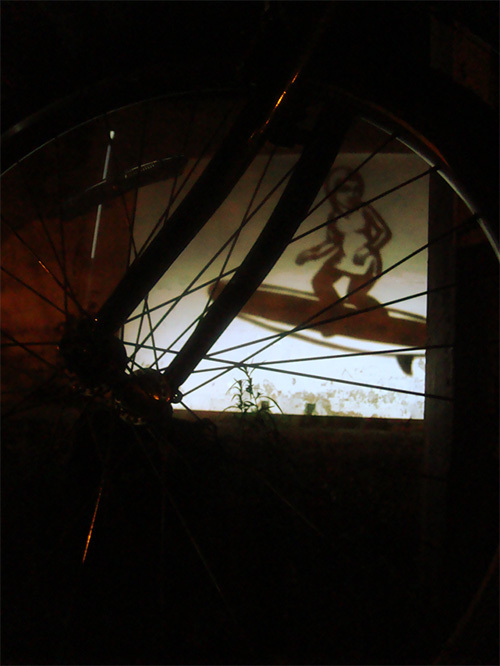 This performance; combining video, shadow puppetry, and live acting, was performed three times under the overpass of the east bank 3rd Avenue Bridge in Minneapolis. “B” was created by Kyle Loven of Open Eye Figure Theater in collaboration with MAW’s ander pander and featuring performance by the amazing Elise Langer. Work by YT; participant’s movements encourage digital plants to grow.